Updates and more awkwardness for you to enjoy. I just wanted to give a little update on how things are going out here in Hamburg, as well as provide more of an insight into the string of awkward encounters which make up my daily existence. We’ve got Herbstferien (Autumn half-term) now for 2 weeks. It might seem a little early, but most colleges and schools here started back at the beginning of August, and despite having only worked for 4 weeks, I’m shattered. Pathetic effort, I know. Some of the tiredness stems from dealing with embarrassment or awkwardness, such as thinking someone’s talking to you, when actually they’re talking to someone behind you. This happened last week when I was walking into the building where I have most of my lessons at college, and I passed someone as they said ‘Moin!‘ Naturally I thought he was talking to me, so I offered a cheery ‘Moin! !‘ (‘! !’ means cheery) in return, only to hear the person his greeting was actually directed to start chatting to him behind me. A little silence followed and so I decided the best way forward was to just die quietly inside and continue on my way. On the bright side, his grammar was flawless. On the less bright side, if you will, everyone looked at me for my reaction to this, and so I aimed to give a little laugh and then begin the task. What came out of my mouth, however, was nothing. Not one thing; I think my face said it all. Once I had picked my jaw up from the floor and stopped my eyes from bulging out any further, I messily started the task. That was my first lesson with that particular class and I wouldn’t be surprised if they’ve already thought of some sort of nickname for me. My ELA friend Ed did also make a case for ‘Highland Spring’ as a better nickname, so watch this space. Just rolls off the tongue, Highland Spring does. So when I asked if they did them, the shop assistant looked at me as if I were quite literally speaking a foreign language (which I was. For me, anyway) and answered, ‘There’s no such thing as a student discount anywhere. It doesn’t exist.’ I apologise for not giving the German for this sentence, but I was so surprised that I can’t remember her exact wording. I did tell her that actually, Urban Outfitters in the Gänsemarkt shopping area in the city, offers a 10% Studentenrabatt (student discount). She looked at me as if I had just insulted her and answered, ‘What’s Urban Outfitters?’ Now, it’s not a crime not to know of Urban Outfitters, but if you’re working for Zara, then you should know of your competitors, surely?! Anyway, I went on my merry way with my new coat. Photo credit goes to Miss Anja Coffey and our good friend Instagram. Living in the ice box that is Hamburg, everyone loves a decent hot drink, don’t they? What I did not love, however, was the mint tea which I ordered at Pony Bar. It had more leaves in it than it did water. 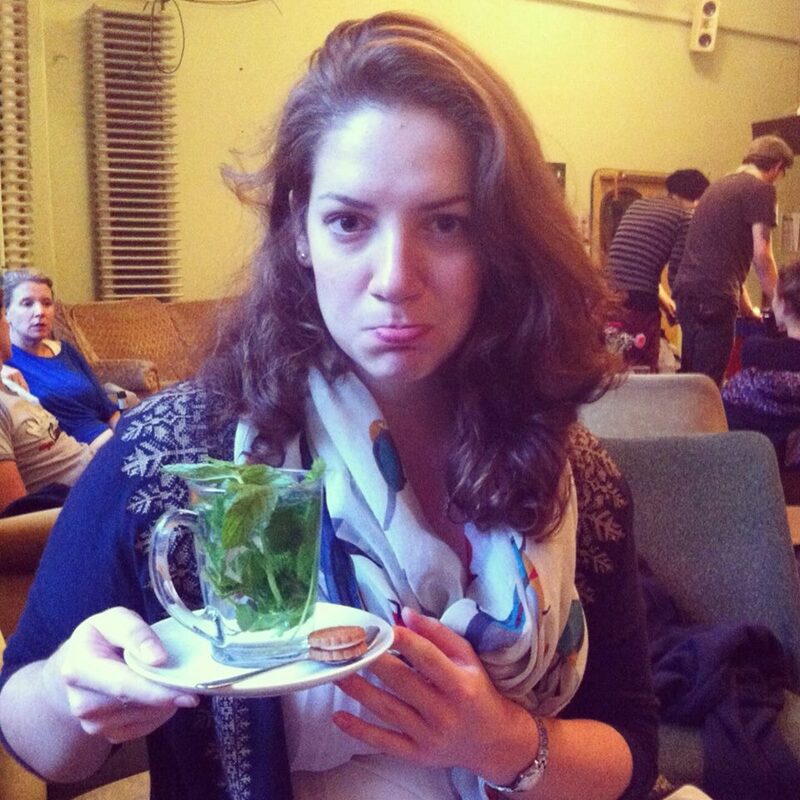 Mint tea is supposed to be a relaxing drink, but there’s nothing relaxing about almost choking on leaves. Sad face. Photo credit goes to Miss Ellie Souter and Instagram, again. Mint tea is healthy, though, which leads me on to my final little anecdote of this post (well done and thank you if you’ve made it this far, I know I waffle! )- the gym. The great thing about my new gym here is that it is empty most of the time. However, on my last venture there I discovered a new kind of gym-goer, known henceforth as the Treadmill Moaner. Usually not found to roam in packs, the Treadmill Moaner lets out a disturbing sound every time his right foot hits the belt of the treadmill. He will also gladly interrupt your workout to borrow something he could get elsewhere, in the absolutely empty gym, whilst also mentioning that if his knees weren’t knackered, he too would be doing some weights work. Safe to say I will not be returning at that time on a Wednesday again, if I can help it. So that’s all from me for now. My plan for the Herbstferien is to turn into more of a tourist and see as much of Hamburg as possible, which certainly beats sitting at my desk and observing the habits of the couple who live across the road from me. The man talks to, and eats breakfast over, his plants. You would be intrigued, too. ← So kids, what have we learnt one month in?